How long will there be gas-powered cars, aka internal combustion engine (ICE) vehicles, on the road? Several of my fellow EV advocates have made grand predictions about "the big" breakthrough. How it is just around the corner and it will launch EVs and they will quickly take over. While that would be nice, things tend to happen more gradually. So if it won't be a breakthrough and a flood, what might the transition to plug-in vehicles look like? Breakthroughs, large and small, can and do happen. However, even when big breakthroughs occur, technology does not immediately disseminate to everyone. The technology has to evolve, become easier to use, more accessible, and move through the technology adoption lifecycle. 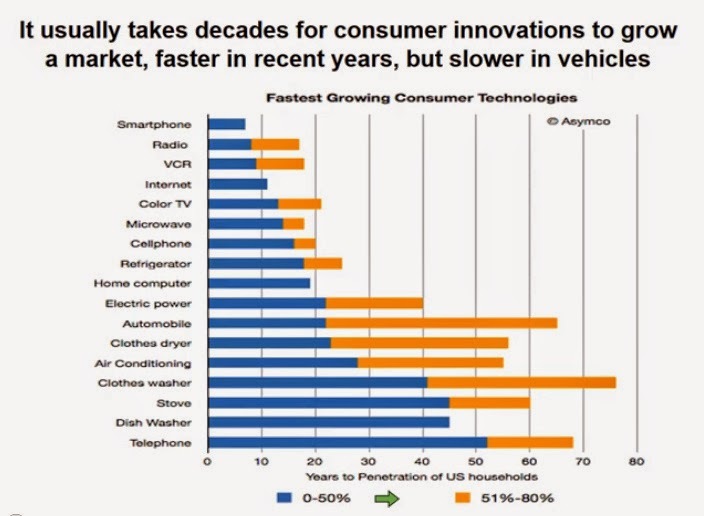 The chart below shows the adoption of recent technology examples like the internet and smartphones, as well as older examples including electricity, telephones, and washing machines. So how long will it take for plug-in cars to dominate the roads? Anytime you look to the future and make a prediction on this scale, two things are guaranteed: one, you are making a lot of assumptions; two, you will be wrong. That said, let's make some predictions. We know the recent history of plug-in vehicle (PEV) sales for 2011-2013. They were 0.14%, 0.37%, and 0.62% of the passenger car market, respectively. This is a good growth rate, but it is still less than a 1% market share. Such a small sample set makes it difficult to know what market share PEVs will have in 5 years, let alone the next 50. 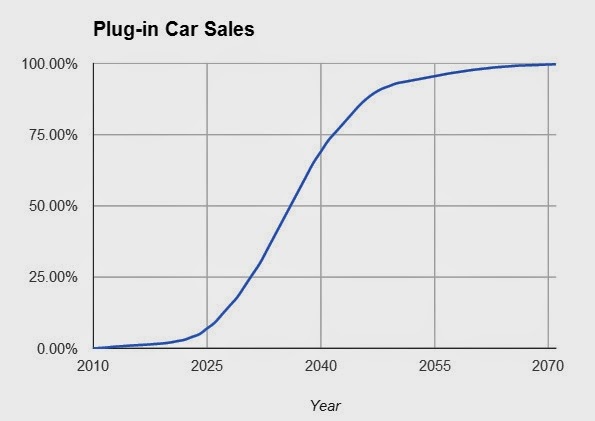 In this model, PEV sales cross the chasm to the mass market during the '20s (2020s that is). PEV sales continue to grow in the '30s and '40s. In the '50s the growth rate slows after dominating the mass market. Now only the laggard buyers remain. By the '70s nearly every new vehicle sold plugs in. 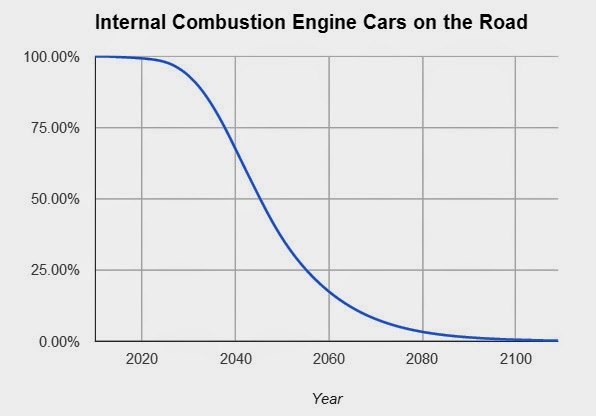 PEV sales cross the chasm during the '20s (2020s that is). Given these sales, how long will there be ICE cars on the roads? The service life of an ICE vehicle can be more than 200,000 miles. In some cases, accidents or poor service cut this life short. I'll assume a mean service life of 12 years. Combining this with the PEV sales data from the chart above yields the chart of ICE vehicles on the roadways below. Although it will be a rare sight, 100 years from now, you might be able to spot the occasional ICE vehicle on the road. Even given these optimistic PEV sales projections, gas-powered cars will dominate the road for at least the next 20 years. And, although it will be a rare sight, 100 years from now, you might be able to spot the occasional ICE vehicle on the road. There is No Market for Hydrogen-fueled cars!